Poor Baby Vaseline Marketing! Stay away from the Pink Jar. I was walking down the aisle of a store in Queens when I noticed the two different Vaseline Jars next to each other. One was pink Baby Vaseline and the other being the common blue jar of Vaseline. So of course this piqued my curiosity...What is the difference between the two? In my mind, I assumed incorrectly (like most people I'm sure) that the Baby Vaseline would be somehow more gentle or appropriate for babies. 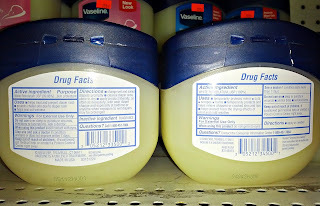 I don't know how you could even make Vaseline more gentle anyway....so this is why I turned the jars around to read the labels. Much to my dismay, I found out what makes "Baby" so special. Take a look at the picture. The jar on the left in the second picture corresponds to the Baby Vaseline and the one on the right is the regular Vaseline. REGULAR VASELINE: 100% White Petrolatum. BABY VASELINE: 99.96% White Petrolatum, Fragrance. Seems like making a product smell particularly "baby fresh" by adding artificial fragrance deems it better for babies than pure product without the fragrance. Shame on you Unilever. In today's age of issues with baby allergens and exposure to hormone altering chemicals in every-day products, we should be extra-vigilant to ensure our growing babies receive only the best in their healthcare products. Now, I'm sure the fragrance is overall quite harmless, but WHY would you even include it in a product aimed for babies, when the regular Vaseline product is completely fragrance free!? This is just an example of marketing at it's best (or worst). Thanks a bunch was about to buy the baby vasaline thinking its more natural. If I hadn't come across your post wouldn't have known otherwise! I just checked mine here in canada it doesn't list 'fragrance' on it even tho it smells. Are they evenot allowed to do that? No one should be using either of these products on a baby. The skin absorbs everything it comes into contact with. 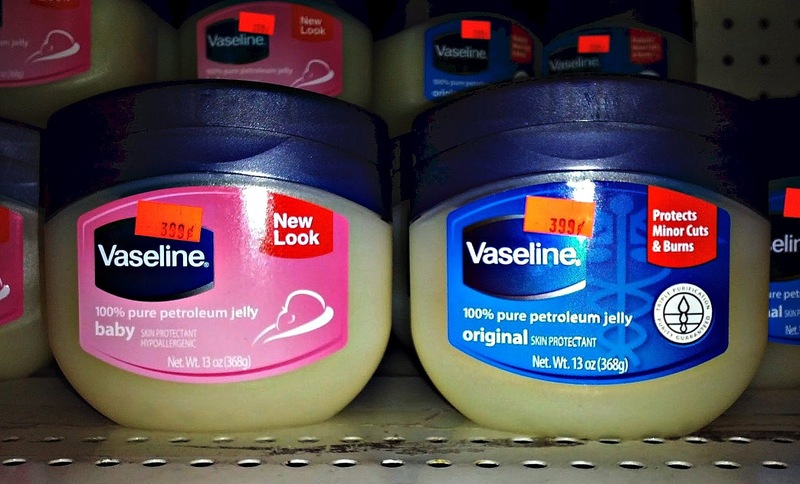 PETROLEUM jelly is just that. It is derived from the oil industry. How about WD40 folks it is the same thing only cleaned up. Interesting note.....my large jar is made in the USA and says inactive ingredients: FRAGRANCE. then I also have a tiny jar I picked up on vacation.......same exact product.....but this one says it is manufactured in South Africa! It lists all the ingredients...there are 10 ingredients for fragrance!! 3 of which I have just been diagnosed with allergy to.....which is why I am reading all the labels in my cabinet! Huh. One was pink Baby Vaseline and the other being the common blue jar of Vaseline. So of course this piqued my curiosity. thanks for share this info..
this product good for women wiht dry skin or lips..